I confess there are times that when counseling others I feel like I’m “winging it” – not sure exactly what to say, how to say it, and unsure just how helpful my words have been (on these occasions, belief in the sovereignty of God is a particular comfort to me!). And I suspect many other ministers would say the same. To the pastor – and to every Christian – who desires to offer godly, sage, and fruitful counsel to people with problems, David Powlison offers much wisdom and encouragement in his book, Seeing with New Eyes. Since the chapters were at one time separate articles, the ride through the book is a little bumpy at times. But overall, the main theme of the book is clear enough: we must counsel people in the light of Scripture. From this one essential theme of the book, there are three major points that Powlison makes again and again in the book. These “bullet points” are not Powlison’s, but mine. But, I believe they do fairly capture the essence of his message. First, though, Powlison’s definition of counseling deserves mention: it is “intentionally helpful conversations” (pg. 1). This way of defining counseling serves us well, for it dispels the notion that Christian counseling is the unique domain of highly-trained professionals. Rather, every believer who, in love, speaks God’s truth to another is engaged in counseling (Ephesians 4:15). In line with this, Powlison writes for ordinary believers. What he says will profit any interested Christian who desires to have “intentionally helpful conversations” with others. 1. Biblical counseling is based on the belief in the utter reliability and sufficiency of Scripture to address our problems. Everything Powlison writes is grounded in the conviction that God’s Word reveals infallible truth about who God is, and who we are his creatures. Our understanding of our true needs, our true problems, the dynamics of personal relationships, and every other dimension of human nature and behavior must come from the Bible if we are to offer any helpful and genuine counsel to others. In fact, the first part of the book is devoted entirely to applying specific Scriptures (Ephesians, Psalms 10 & 131, and Luke 12) to a whole host of struggles and problems that drive people to seek counsel: troubled relationships with others, fear, anxiety, suffering because of abuse, and so on. In this way, Powlison demonstrates how biblical counseling is not just a name for secular counseling with a Christian veneer, but is rather an approach to understanding the human condition in the full light of God’s revelation to us in the Scriptures. 2. Biblical counseling apprehends the profound depth and power of sin. Taking the Bible seriously means taking sin seriously. This may be the most helpful aspect of Powlison’s work, because again and again he shows how secular psychological theories and practice, and more dismayingly, how much that goes on in the name of Christian counseling, either outright denies sin, or tames sin to the point of irrelevance. 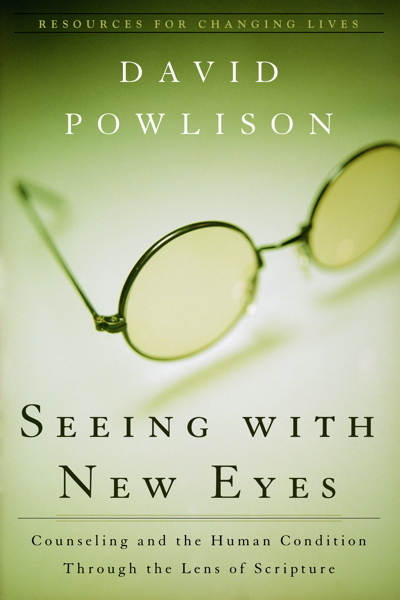 In the course of the book, Powlison analyzes a whole host of common counseling terms, metaphors, and models, both secular and “Christian”, to show how they fail to do justice to the Bible’s comprehensive view of human sin (and therefore fail to address the deepest cause for human misery and need). This includes the notion that family upbringing determines future behavior (chapters 10 and 12), the morally neutral categories of “defense mechanisms” (chapter 11), the idea that unmet emotional needs are the source of human dysfunction (an “empty love tank”, chapter 14), and the growing use of drugs to treat psychological problems (chapter 15). In their place, Powlison offers biblical concepts and terms that account for the true nature of man: pride, lust, idolatry, fear of man, and so on. Man is not a machine that can be fixed like a broken engine, but an image-bearer of God created to be in communion with God and others. But, sin has destroyed our fellowship with God and it poisons our relationships with other people. For this reason, as Powlison writes, “… the Bible never views human problems as ontological but as relational or ethical at their cores” (pg. 192). So, the goal of biblical counseling is not merely modified behavior, but repentance and turning in faith to Christ. And that leads to the third major point Powlison makes – the hope that true biblical counseling holds forth. 3. Biblical counseling presents to people the one true source for human well-being: Jesus Christ. The aim of biblical counseling is no different from the aim of all ministry of the Word – to bring people to saving faith in Christ and establish them in that faith. Because at heart our problem is sin (no matter how our experiences have shaped us), above all we need grace, forgiveness, and salvation. Powlison always keeps this in view – he never sets up mere human happiness or improved behavior as ends in themselves. Rather, his passion in counseling, which is evident throughout the book, is to lead people to a greater knowledge of God through faith in Christ. Only Jesus can impart true and lasting peace and joy to the human heart. Therefore, only that counseling that leads people to the life-giving Savior is truly “biblical”. Seeing with New Eyes is a straightforward and unabashed appeal for counseling that is comprehensively Scriptural. And so he levels some hefty (and necessary, in my view) criticism against theories of counseling that are secular or only superficially Christian. But Powlison cannot be dismissed as a fundamentalist crank who in knee-jerk fashion rejects all of which he is ignorant. He was educated and trained in psychiatry, and for four years worked in psychiatric hospitals. In the book he interacts intelligently, though critically, with mainstream secular views of counseling. So Powlison writes about counseling from a decidedly biblical perspective, but also with the personal authority and credibility of one who also has extensive experience in, and knowledge of, the wider field of counseling. One would hope this would help give him a broader reading outside of Christian circles, but I suspect that is unlikely. Insofar as Powlison wants to stress the “living and active” nature of God’s Word (Hebrews 4:12), as opposed to dry, esoteric information, I agree with him. But I wonder if someone might get the idea that any formal instruction in theology (for example, catechism training), that is given apart from immediate application is unhelpful and unnecessary for Christians? I don’t think Powlison believes this, but as he emphasizes so strongly the practical nature of Scripture, a person could come away with this impression. The second question that came to mind concerns the context in which biblical counseling takes place. If the Bible provides the truth with which we understand people and give them counsel, it also gives us the context in which we as Christians are to grow in our faith. And that context is the church with its life and ministry: preaching, teaching, the sacraments, prayer, and fellowship. Actually, Powlison addresses this question in the Preface where he writes that the second book of this series will speak of the institutional structures in which biblical counseling takes place. But without bringing the life of the church to the fore at this point, one might get a truncated view of biblical counseling – that like secular models, it’s all about what takes place between the counselor and person counseled. But the biblical model of growth in grace involves so much more – it involves the entire ministry of the church and the whole Body of Christ (Ephesians 4:1-16) . Again, Powlison wouldn’t deny this, but the all-important context of biblical counseling is mostly left out in this volume.